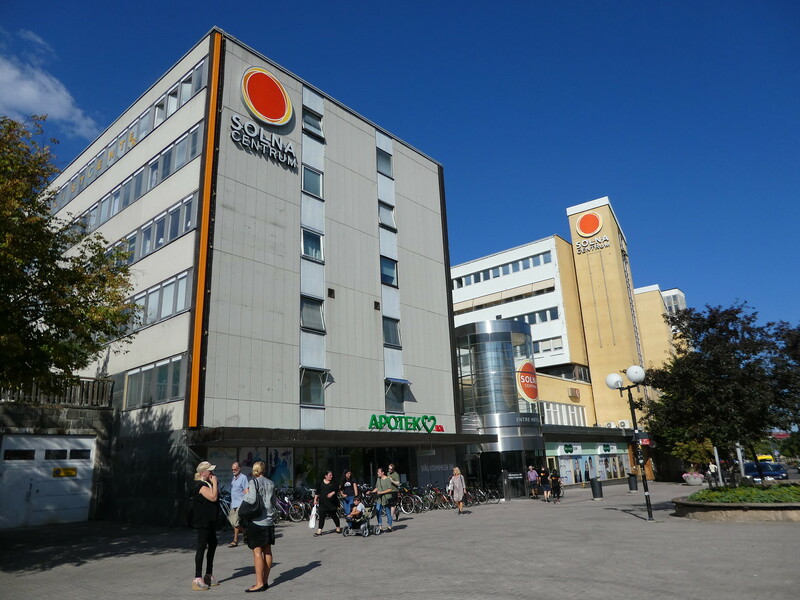 We made a leisurely start to our final full day in Stockholm with a forest walk through the nearby Solna neighbourhood and then a look around the shopping centre next to the Solna Centrum metro station. From the exterior, the shopping mall appeared quite small but once inside, we were surprised to find it was actually quite large with numerous shops and cafes. After our dose of retail therapy we caught a No.22 tram from the rear of the shopping centre to its terminus at Sickla, the journey taking just over an hour. The tram was hot and stuffy and the journey very slow but we weren’t in any rush and eventually arrived at Sickla station. From there, we crossed the platform and transferred to an awaiting light rail train as far as Fisksätra, the entire journey being covered by our SL-Access travel card. The latter part of the journey was very scenic as the train hugged the coastline and we enjoyed some lovely views through gaps in the trees. 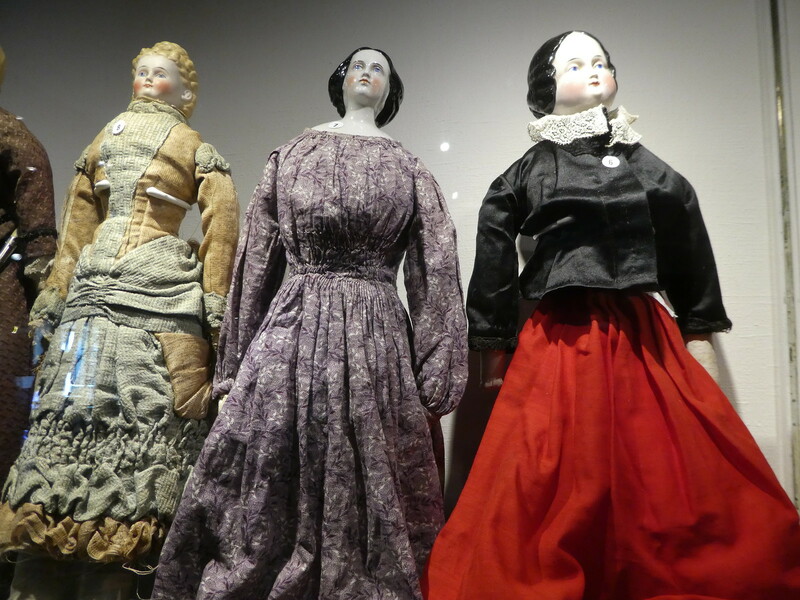 The main reason we had travelled out to Fisksätra was to visit yet another toy museum that I’d read about. The museum was quite easy to find and was less than ten minutes walk from the station. 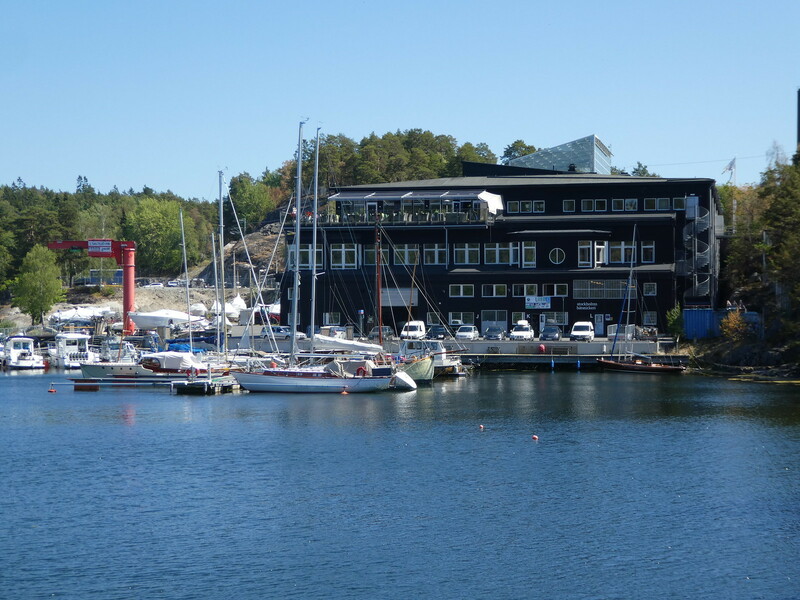 The Leksaksmuseet is located in a building overlooking the marina and shares its entrance with the Hamm Battlefield Museum. Entrance to the toy museum costs SEK 70 (£6.05 each) and although it’s much smaller than the one we visited in Skeppsholmen, it contains hundreds of old toys illustrating how children played during the last century. 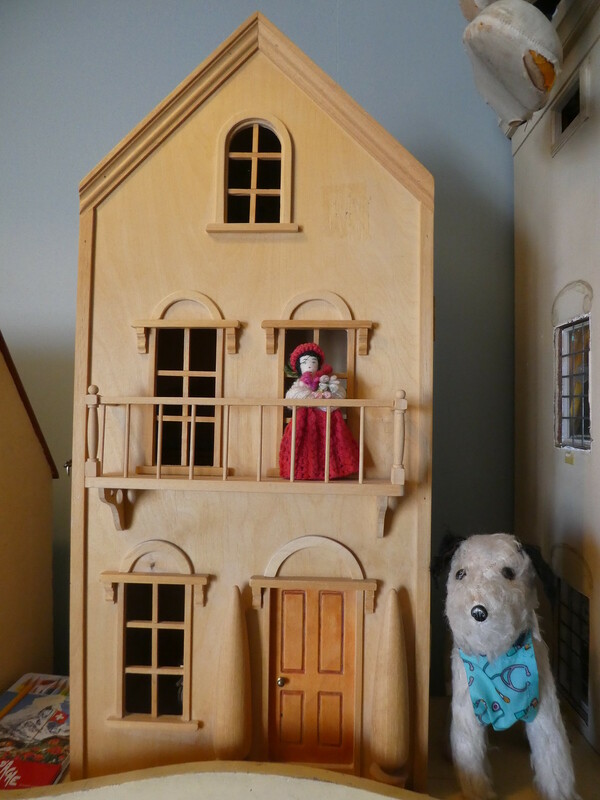 There are dolls and their houses, trains, cars and planes with an emphasis on mechanical toys. The museum had only been in its current location for two months so was still being set up. Two of the three model railways could be operated by pressing a button but not all the track had been laid and members of staff were working on them whilst we were there. The exhibits provided me with fond memories of toys and games I used to play with such as Barbie dolls and I was interested to see a Swedish version of the Cluedo board game which was marketed as Sherlock Holmes there. 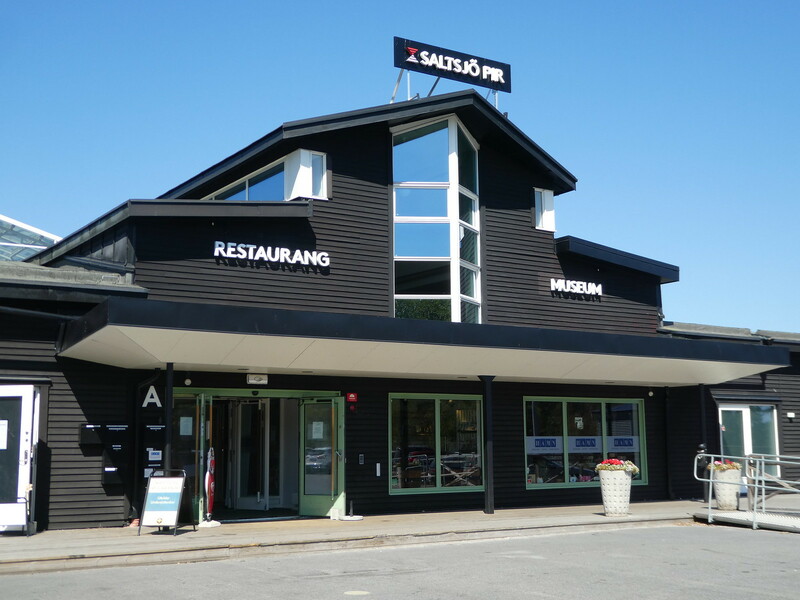 Leaving the museum, we spotted a sign advertising a restaurant at the far end of the building so headed along a corridor to investigate and were surprised to find an attractive bistro with outdoor seating on its balcony overlooking the water. The buffet lunch looked very appetising and including coffee was less than £10 which was very reasonable by Swedish standards. Sitting on the balcony of the Saltsjo Pir Restaurant we had the most idyllic views across the bay and it was so beautiful that we stayed quite awhile watching sailing boats drift past and children playing on the nearby beach. 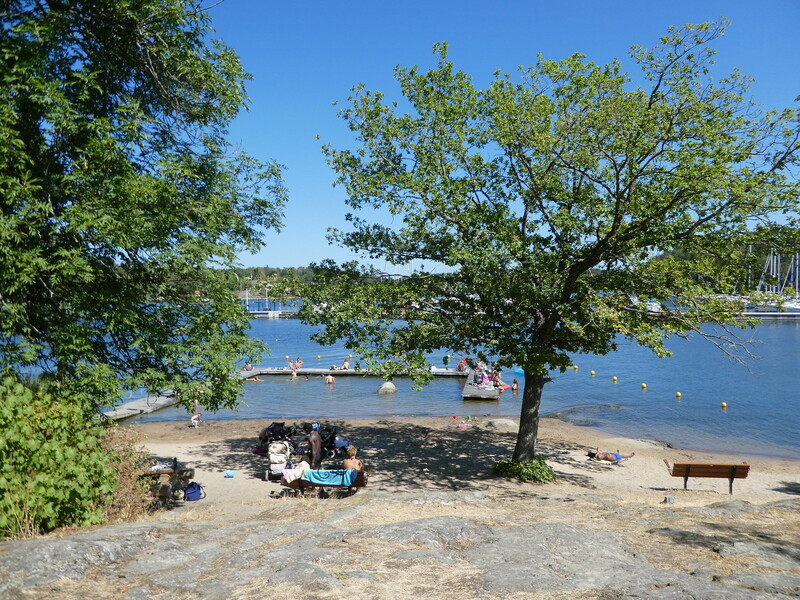 After a second cup of coffee, we decided to take a stroll along the water’s edge by the marina and then cross a small footbridge into the woods to the small beach with its designated swimming area that we had been able to see from the restaurant. As it was yet another hot, sunny day families were enjoying spending the day on the beach and having picnics in the woods. There were several public barbecues but these were all out of action due to the hot, dry conditions and the risk of forest fires. 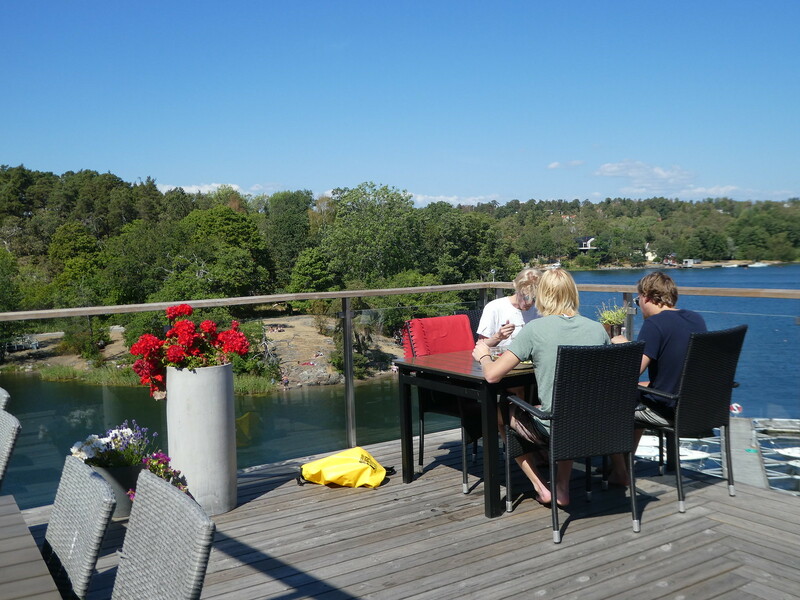 The beautiful setting of Fisksätra had been an unexpected bonus and turned out to be a delightful place to spend a relaxing few hours away from the city centre, and its one and only seaside restaurant was a hidden gem. 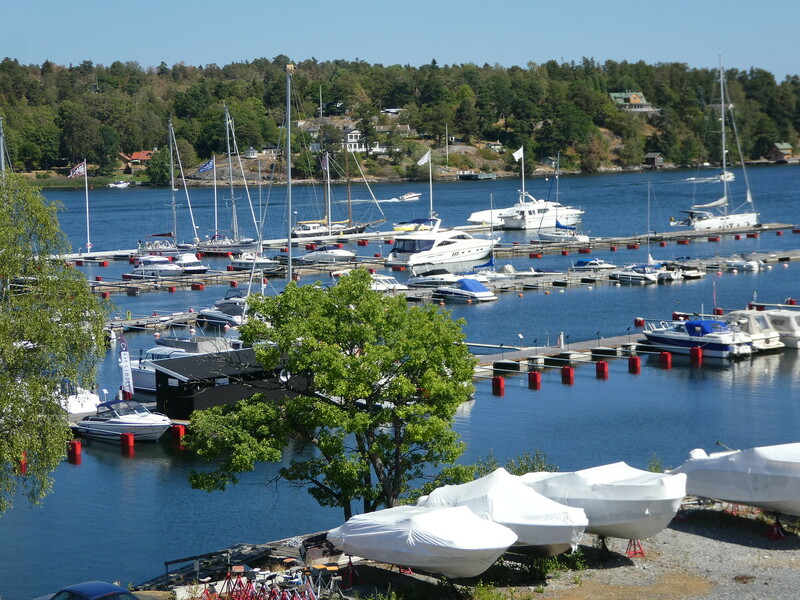 We then retraced our steps back to the marina where we paused to admire some of the boats before returning to our accommodation in Solna by the same route we had arrived on. After eating, we quickly gathered our belongings together before taking the metro to Kungsträdgården at the end of the Blue Line for the final time this holiday. 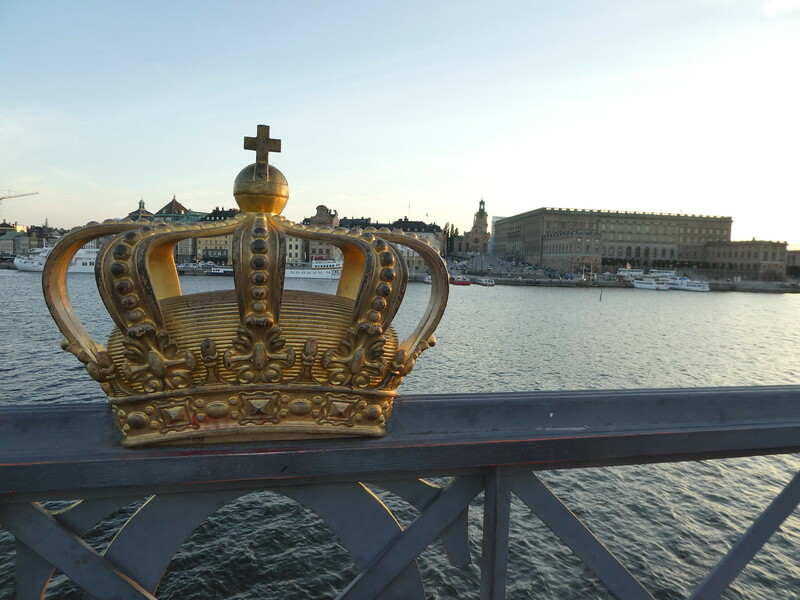 We strolled along the now familiar waterfront, passing the Grand Hotel and continued across the ornate bridge with its gilt crown over to Skeppsholmen island. As we wandered along the promenade, the setting sun cast a golden glow over the royal palace making it look even more beautiful than ever for our final photos. It looks so pretty by the water! Looks like you had a good trip! It was gorgeous Jason, wall to wall sunshine the entire two weeks too! Thank you for your kind words. It’s so nice to read that you are still enjoying reading my posts. Thanks for your delightful comments Ian. 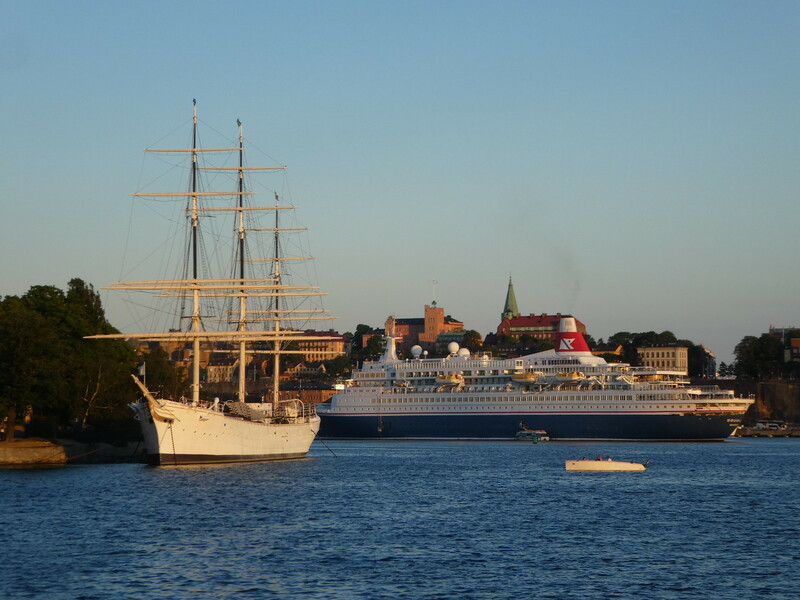 It’s so nice to read you enjoyed my posts in Stockholm. There is actually just one more post of this trip and I think you might like it too! Somewhere down the line I have Swedish ancestors and have thus always wanted to visit. Your blog made me want to visit even more than I already did! Thank you for all of the info! It’s a pleasure Amber. I’m certain you will enjoy finding your roots in Sweden. Thank you, it’s so nice to read that you enjoyed this post. I just can’t seem to get enough of these posts! Thanks for sharing! Thank you so much for your absolutely lovely comments – it makes my writing so worthwhile! This makes me miss Sweden so much!! Can’t wait until I’m back in December! Thank you for your kind words and enjoy Sweden next month, it must look beautiful at Christmas! Thanks Jo, I’m certain we’ll return to Sweden before too long!